One of the all-time greats in NFL history, Jim Brown was a special talent that put forth, arguably, the most productive career in league history despite leaving football for good at age 29. 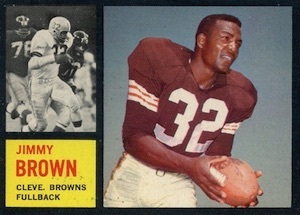 Debuting at an iconic period for football card collecting, Jim Brown cards, especially his vintage releases, remain very popular with collectors. 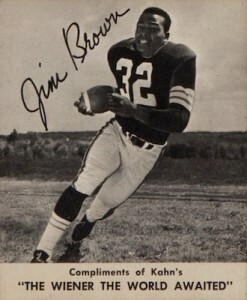 Shop for Jim Brown Autograph Cards on eBay. 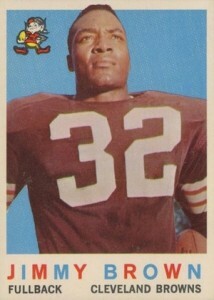 A unique combination of speed and size, Jim Brown was a game changer at running back during his nine seasons with the Cleveland Browns. He was a Pro Bowl selection in every year and led the league in rushing yards in each season except for one. It is easy to wonder what might have been if Brown had continued his career. However, collectors don't have to wonder about his cardboard legacy, as Jim Brown's career coincided with some very popular releases. 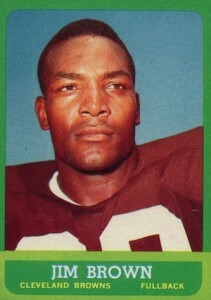 Starting with his earliest card in 1958, Jim Brown cards are available for each season of his career. Following his retirement, there is a decent collecting void until the 1980s. Things really picked up for collectors in the 1990s, including Jim Brown autograph and relic cards, and he has remained a fixture of NFL products since then. The following guide looks at 15 of the greatest Jim Brown cards of all-time, with a heavy focus on his vintage releases. The clear favorite for collectors, the 1958 Topps Jim Brown rookie is one of the top vintage football cards in the hobby. 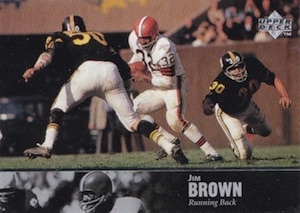 The natural background might have been a distraction if not for the black oval that immediately makes Jim Brown the primary focus of the card. Ungraded versions and low grades start around $100, but high grades push well into the the five-figure range. One of the more non-traditional cards on the list based on the measurement (2-7/8" x 5") and original location, 1959 Bazooka Football cards were only available on the back of Bazooka Bubble Gum boxes at a rate of one per box. The appealing design and considerable rarity of these hand-cut cards makes for a tough chase. 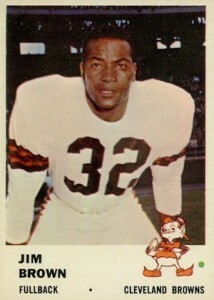 A regular in the card market during the 1950s and 1960s, Kahn's Wieners is no joke when it comes to Jim Brown cards. 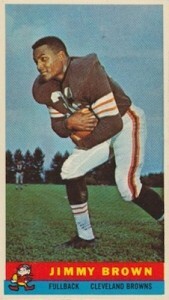 Available each year from 1959 to 1964, the first Kahn's card for Brown was part of a 31-card set that covered the Cleveland Browns and Pittsburgh Steelers. Larger than the average card (3-1/4" x 4"), the 1959 Kahn's cards are more rare because they had limited distribution as the first edition. Mid- and high-grade examples are even harder to find due to the fact that they were originally released in a food product. With a stoic image of Jim Brown and vibrant colors, 1959 Topps might be the best-looking card available for collectors. 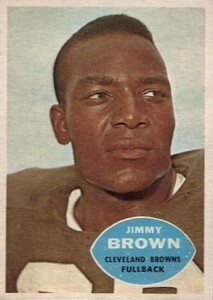 As the second Topps card for Jim Brown, prices are much more reasonable and it offers a great alternative for collectors who cannot afford the 1958 rookie card. 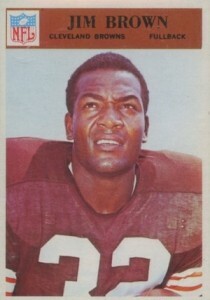 More generic than previous Jim Brown cards, 1960 Topps is basically just an image along with a football-shaped text box. While low-grades are largely inexpensive, high-grades are tough to come by thanks to centering issues and the green borders on the card backs. Heavy on white, the only Fleer card for Jim Brown showcases a pre-game image with the stands in the background. While it is not the first card to feature the mascot logo for the Browns, 1961 Fleer utilizes a large image of the creepy creature and it can be hard to focus on anything else. Continuing the generic look from Topps, 1961 brought a bright blue background and black text box at the bottom. 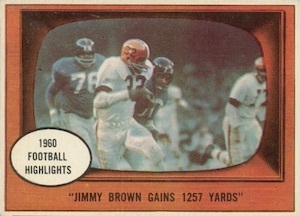 In addition to the main base card, there is also a "1960 Football Highlights" subset card for Jim Brown that evokes the feel of watching Brown on television. 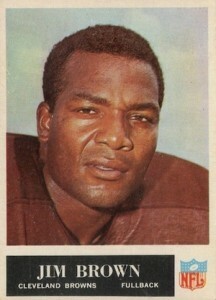 The image for Jim Brown's 1962 Topps card is very similar to the previous year. 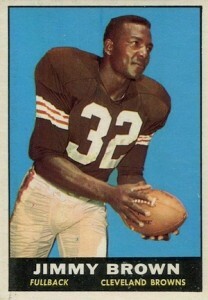 What's not the same is the black border that makes 1962 high-grades for Jim Brown a daunting task. A PSA 8 sold for $1,920 in November of 2014. 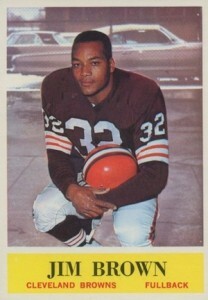 Also tough to find in high-grade, the 1963 Topps card for Jim Brown is part of a large group of short prints. The colorful border causes considerable issues for collectors. Part of the first NFL product for Philadelphia Gum Company, the Jim Brown card in 1964 Philadelphia features a Cadillac in the background. While there has not been a clear explanation, the same car is shown in all the other backgrounds for the Browns' cards in 1964. 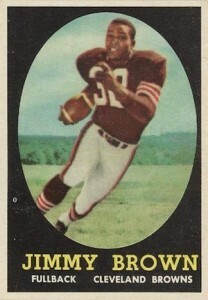 The 1965 Philadelphia Jim Brown cards follows the same plain look as previous Topps releases, opting for a tight shot and limited design. With basically an inverted version of the 1965 design, 1966 Philadelphia includes the text on the top of the card and a different text box color. Already noteworthy as the last release for Jim Brown following his retirement after the 1965 season, this is also a tough card to find in top grade. While his first autograph came in 1992 All World and nearly any certified card would make a good addition, the best overall signed card for Jim Brown came in 1997 Upper Deck Legends. 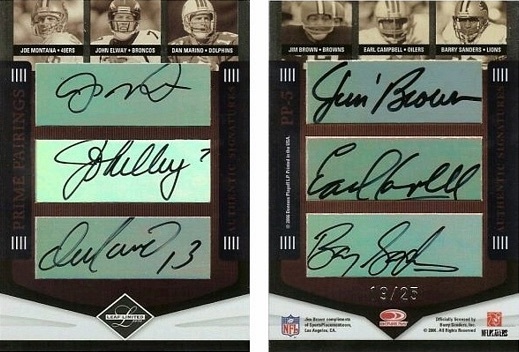 The popular product remains one of the most-collected autograph sets and Brown's card is one of the short prints. The cards rarely surface and the image shown below is for the base version, which is identical except for the #AL- prefix on the card numbering. 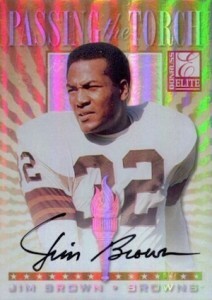 The same product also yielded a Sign of the Times autograph for Jim Brown, numbered to 100, that is very popular. 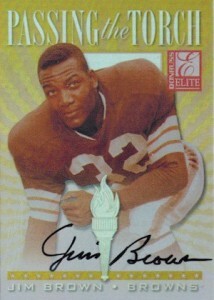 Part of a popular insert that continues to this day, Passing the Torch Autographs in 1999 Donruss Elite offered collectors two signed card for Jim Brown. Card #11, shown on the left, includes just Brown, while card #10 pairs him with Terrell Davis. Both cards are numbered to 1,500 copies, but only the first 100 cards were signed. 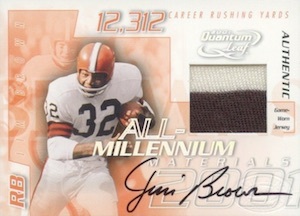 2001 Leaf Quantum brought the very first autographed relic card for Jim Brown with their All-Millennium Materials insert line. 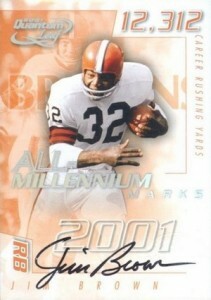 While all 100 copies for Jim Brown included game-used jersey pieces, only the first 25 cards were signed. There is also a signed vertical version that is numbered to 100. 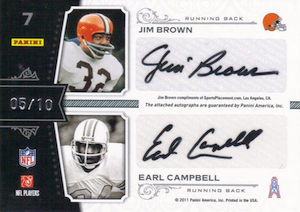 While they are individually very rare, Jim Brown has been included with many other greats of the game on multi-signed autograph cards. 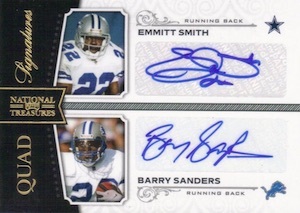 He is commonly paired with other running backs, especially Barry Sanders, and these cards limited allow a nice combination of past and present. Check out all available options by following the links. JIM BROWN 07 NATIONAL TREASURES AUTO ALL-DECADE AUTOGRAPH CARD #42 99! 1964 Philadelphia - # 30 Jim Brown - NFL & Cleveland Browns HOF FB - Syracuse U. 2009 TTT GALE SAYERS JIM BROWN BARRY SANDERS 1 1 BGS 9.5 9 AUTOS !! 2001 QUANTUM LEAF JIM BROWN 1 1 BGS 9.5 10 AUTO ! !